Red Bay is a peaceful city of approximately 3,200 residents located in western Franklin County, Alabama, nestled against the Mississippi state line. The trade area for the community extends to include almost 15,000 residents. The city is served by two primary highways: Alabama Hwy. 24 and Alabama Hwy. 19. Highway 24 provides four-lane east-west access from just beyond the Mississippi state line through north Alabama to the state line at Bridgeport, Tennessee, allowing access to Interstate 65 along the way. Red Bay is also locate just 20 miles from Interstate 22, which connects Birmingham, Alabama to Memphis, Tennessee. 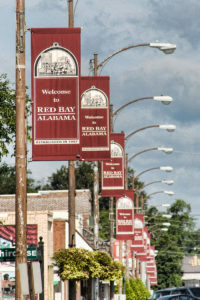 Red Bay is one of the most industrious communities per capita in the state of Alabama and features a variety of industry types. We are blessed to have homegrown, nationally known industries such as Tiffin Motorhomes and Sunshine Mills. Gates Corporation also employees dozens from the area at its Red Bay plant. The quality of the area’s workforce has helped these industries and their affiliated businesses to be successful. Red Bay is also fortunate to have a quality hospital serving the region. Red Bay Hospital is a 30-bed affiliate of the Huntsville Hospital healthcare system, providing emergency, primary and rehabilitative care services to residents of the region. Red Bay High School serves area students from grades Pre-K through 12, offering educational opportunities to prepare our youth for success. The academics are matched by the quality of the athletics programs offered by the school, which were recently ranked 19th best in the state of Alabama (second-best in Northwest Alabama) by Al.com/The Birmingham News. There is so much more that could be said about our great city, and we try to give you a glimpse of what to expect here throughout our website. Come visit us soon and you’ll learn by Red Bay is a great place to live, work, worship and play.